His reign can be seen as the peak of the Kassite Dynasty's prominence and subsequently Kassite culture declined, exemplified by his successful military campaigns against Assyria and Elam, the glyptic style of cylinder seals, the literature inspired by him (Hemerology for Nazi-Maruttaš) and his appearance in the period piece Ludlul bēl nēmeqi, which was set during his reign. Nazi-Maruttaš faced a growing threat from the ascendancy of Assyria under Arik-den-ili and his successor Adad-Nīrāri I. The containment of Assyria was conducted through a strategy of flank attacks supported by his agents, eastern hillmen such as the Gutians, in a protracted war, avoiding a full frontal assault. Under Arik-den-ili, he seems to have had the upper hand, because Adad-Nīrāri, who styles himself “King of the Universe”, later recounts[i 3] that “my father could not rectify the calamities inflicted by the army of the king of the Kassite land” in a contemporary Assyrian epic. There is evidence of a successful attack on Elam, because texts[i 6] of this period concerning ration lists and foreign prisoners of war, mentions Nazi-Maruttaš in sections concerning Elamites. A historical letter[i 7] detailed his campaign in Mat Namri, a Hurrian region, and possibly his conquest of its twelve cities. A fragment of a tablet[i 8] relates that “Marduk ca[used] all the lands [to bow down] at his feet”. A treasury list[i 9] catalogues more than 125 precious artifacts and their move from Dūr-Kurigalzu and Nippur to Ardi-Bêlit during his 5th year, possibly for safe keeping. He is known to have made at least three Kudurru boundary stones, although the one pictured[i 10] is a later stone copy made during the reign of Marduk-apla-iddina I to replace the clay original (narū ša haṣbi) which was crushed by a falling temple wall. A shrine to Gula was uncovered in 1946 in an eroded building with a pavement of much damaged kiln-baked bricks, some inscribed for Nazi-Maruttaš. This was located in the palace area at the Kassite capital, Dūr-Kurigalzu. Work was also undertaken at Nippur, and excavations have yielded various tablets. He was also active in building as far south as Uruk, the cella of the Eḫiliana of Nanâ, as attested to by a later inscription by Esarhaddon. [i 11] Other cities formerly abandoned such as Larsa, Ur, Adab, and Isin show evidence of revival in his reign. There are nearly 400 economic texts dated to years up to the twenty fourth of his reign, detailing things as mundane as the receipt of barley and malt, the issuing of grain, goats, hides, sheep and oil. A tablet found in Tell Kirbasi, on the south side of the central Hor al-Hammar 30 km west of Basra, lists 47 head of cattle in the sixteenth year of Nazi-Maruttaš, showing the extent of trade. A single standard hemerology, or uttuku, was collated during his time. Its colophon reads, "Dies fas according to the seven a[pkallī?] originals from Sippar, Nippur, Babylon, Ur, Larsa, Uruk and Eridu. The scholars excerpted, selected, and gave to Nazi-Maruttaš, king of the world.” This was a sort of almanac stating which days of each month were favorable, unfavorable, or dangerous for activities of interest to the king, such as those propitious for begetting children, or setting taxes. It was typically used by scribes, temple administrators, priests, cultic singers and exorcists and provided detailed instructions for "auspicious days”. Five extant examples[i 12] have been found, including a bilingual copy in Dur-Kurigalzu, another found in the house of LÚ.NAR.GAL “cultic singers” in Aššur and a third in the house of Kiṣir-Aššur, exorcist of the temple of Aššur during the reign of Aššurbanipal. Lambert has argued that Ludlul bēl nēmeqi was composed during his reign based upon the identification of the protagonist Šubši-mašrâ-Šakkan with that of a character in a fragment of an epic of the Kassite times,[i 13] and to the governor, or lúgar kur, of Ur during his 16th regnal year. Nazi-Maruttaš’ name appears on the reverse of a literary text fragment known as KAR 116[i 14] which Lambert identified as belonging to this work. The prominent physician, or asû, from Nippur, Rabâ-ša-Marduk, began his lengthy, well-attested career during Nazi-Maruttaš’ reign. 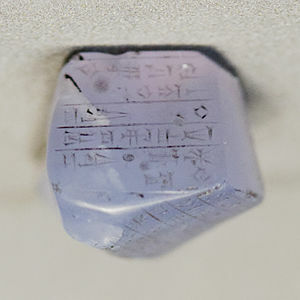 ↑ 1.0 1.1 AO 7704, an irregular block of chalcedony with a nine-line Sumerian inscription, now held in the Louvre, transcribed: na-zi-ma-ru-ut-ta-aš, šàr kiššati (šár), mār ku-ri-gal-zu, šàr bābili (ká.dingir.ra)ki, ša šumi, ša-aṭ-ra, ip-pa-aš-ši-ṭú, dŠamaš u dAdad, šum-šu lip-ši-ṭú. ↑ According to the Kinglist A tablet, BM 33332, column 2, line 2, in the British Museum. ↑ In the Epic of Adad-Nārāri, tablet VAT 9820 line 12: hi-ib-lat um-ma-ni MAN KUR ka.-.i-i a-bi ul ul-te-.èr. ↑ Synchronistic Chronicle (ABC 21) tablet C, column 1, lines 24 to 31. ↑ Tukulti-Ninurta Epic, extant in fragments BM 98496, BM 98730, BM 98731, BM 121033. ↑ Ration lists Ni 6932 Šagarakti-Šuriaš year 9 and Ni 7050 Kaštiliašu IV accession year. ↑ K 11536 published in MSKH I as U.2.26, p. 282. ↑ 10.0 10.1 Kudurru Sb. 21, a later stone copy of clay original. ↑ Esarhaddon inscription YBC 2146. ↑ KAR 147, KAR 177 (=VAT 9663), etc. ↑ K 9952 W G Lambert BWL pl. 12 pp 296f., BM 35322, Sp. II,893. ↑ KAR 116, tablet VAT 11245 r. 10. Article discussing Nazimaruttaš Kudurru, (Boundary Stone). ↑ Wilfred G. Lambert (2007). Babylonian Oracle Questions. Eisenbrauns. p. 3. ↑ Donald M. Matthews (1992). The Kassite Glyptic of Nippur. Vandenhoeck and Ruprecht. p. 62. ↑ 3.0 3.1 3.2 I. E. S. Edwards, ed. (1975). Cambridge Ancient History, Volume 2, Part 2, History of the Middle East and the Aegean Region, c. 1380-1000 BC. Cambridge University Press. pp. 32, 274–275. ↑ 4.0 4.1 4.2 J. A. Brinkman (1976). Materials for the Study of Kassite History, Vol. I. Oriental Institute of the University of Chicago. pp. 262–286, 385. ↑ Christopher Morgan (2006). Mark William Chavalas, ed. The ancient Near East: historical sources in translation. Blackwell Publishing. p. 150. column 4, line 34. ↑ H. W. F. Saggs (2000). Babylonians. British Museum. p. 119. ↑ 7.0 7.1 Leon Legrain (1922). Historical Fragments. Philadelphia: University Museum. pp. 97–99, 102–106. ↑ Dominique Charpin (2011). Reading and Writing in Babylon. Harvard University Press. p. 216. ↑ "VI. The Kassite and Neo-Babylonian Periods in Southern Iraq (c.1600–550 B.C.)" (PDF). Ashmolean Museum: 136. ↑ R. L. Zettler (1993). Nippur, Volume 3: Kassite Building in Area WC-3. Oriental Institute Publications. pp. 100, 106. ↑ M. Sigrist, H. H. Figulla and C. B. F. Walker (1996). Catalogue of Babylonian Tablets in the British Museum, Volume II. British Museum Press. p. 82. BM 17729. ↑ H. H. Figulla (1961). Catalogue of Babylonian Tablets in the British Museum, Volume I. British Museum Press. p. 100. BM 13278. ↑ Daniel T. Potts (1997). Mesopotamian civilization: the material foundations. Cornell University Press. p. 36. ↑ William W. Hallo (2009). The World's Oldest Literature: Studies in Sumerian Belles Lettres. Brill. p. 242. ↑ Ralph Mark Rosen (2004). Time and Temporality in the Ancient World. University of Pennsylvania Museum of Archaeology and Anthropology. p. 65. ↑ 16.0 16.1 Alasdair Livingstone (2007). "The Babylonian Almanac: A Text for Specialists?". In Brigitte Groneberg, Hermann Spieckermann. Die Welt der Götterbilder. pp. 85–101. ↑ Simo Parpola (Jan 1983). "Assyrian Library Records". Journal of Near Eastern Studies. 42 (1): 7. doi:10.1086/372983. ↑ W. G. Lambert (1998). John Day; Robert P. Gordon; Hugh Godfrey Maturin Williamson, eds. Wisdom in Ancient Israel. Cambridge University Press. pp. 33–34. ↑ Nils P. Heeßel (2009). "The Babylonian Physician Rabâ-ša-Marduk: Another Look at Physicians and Exorcists in the Ancient Near East". In A. Attia, G. Buisson. Advances in Mesopotamian Medicine from Hammurabi to Hippocrates. Brill. pp. 13–28.